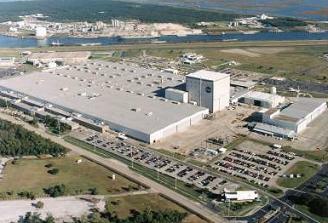 Following the arrival of the last External Tank (ET-122) at the Kennedy Space Center (KSC), the Michoud Assembly Facility (MAF) now heads into an uncertain future. 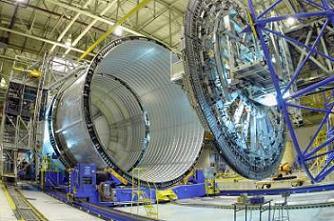 Hundreds of Lockheed Martin workers now face imminent layoffs, as the facility winds down operations, with the hope of new life being breathed into the facility firmly focused on a role with the development of a Heavy Lift Launch Vehicle (HLV). The New Orleans facility will soon lose a significant amount of its workforce within days, as production grinds to a halt, now that all the flight tanks have been shipped. MAF will continue to tick along via a support role related to the three tanks now at KSC (ET-137, ET-138 and ET-122 – the latter of which arrived at KSC on Monday, and will be offloaded on Tuesday), although without a concrete plan for what to do after the Shuttle program ends, and funding running out at the end of the fiscal year, contractors must continue to layoff workers. Lockheed Martin will be forced to layoff the balance of the External Tank production workforce at MAF at the end of this week, according to Harry Wadsworth, a spokesman for Lockheed Martin – who noted the company will be shedding approximately 350 people this coming Thursday. That will leave approximately 550 people at MAF, a figure that includes approximately 200 people working on the Orion spacecraft. There’s also an additional 100 Michoud operations people located at the Marshall Space Flight Center (MSFC) and the Kennedy Space Center. ET-122’s departure last week didn’t leave the facility empty of tanks, with one fully assembled tank and several part built tanks in storage. 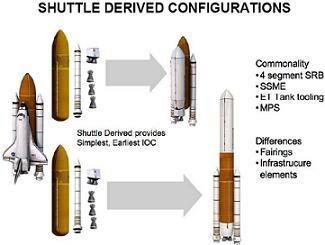 The fully-assembled ET-94 is the focus of studies and proposals for a SD HLV (Shuttle Derived Heavy Lift Launch Vehicle), or Space Launch System (SLS) – a proposed vehicle which could utilize existing Space Shuttle and Constellation personnel, facilities, and hardware. The ET is a Light Weight Tank (LWT) – as opposed to a Super Light Weight Tank (SLWT) – which would result in a large loss of upmass ability, if added to a notional STS-136 mission. It would also require lengthy work via numerous Return To Flight modifications. “ET-94 is the last of the assembled tanks and it would require a significant amount of modification as a Shuttle flight asset,” Pat Whipps, NASA resident manager at Michoud and ET deputy project manager, said in an interview with NASASpaceflight.com. While the bill passed the Senate, a House of Representatives committee has also crafted a separate NASA authorization bill, and negotiations on what bill language may be considered by the full Congress continue even as the end of the current fiscal year and the beginning of the next one approaches at the end of the week. However, as has been the case for months, the clock is ticking, as contractors such as Lockheed Martin have their hands forced into laying off valued skill set workers. “At the end of September, the plan is for a significant reduction in workforce primarily associated with the production folks,” Whipps added. “There is a flight operations support contract that continues into next year, which would [retain] a relatively modest number of people, several hundred. 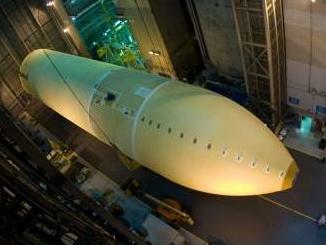 Also playing against using ET-94’s refurbishment as a tank for Shuttle flight use, Whipps noted it would take a considerable amount of time to bring it up to the standards required by the Space Shuttle Program (SSP), a timeline that only worsens the longer it takes the lawmakers to make a decision. “There have been numbers from 12 and 24 months, and a lot of it is predicated not just on the amount of work it takes to get done, but on whether there’s still workforce available in the vicinity [of] the New Orleans metro area to do that,” Whipps added. “The longer we wait for the decision, the less workforce there is, and that starts to stretch [the estimate] to the right more. It’s either going to take more time to either reconstitute that workforce and train it or to get folks back, depending on the timeframe they make the decision. Regardless, NASA is preparing for the possibility that Congress and the President will authorize the start of HLV development. While no “work” can be done on existing hardware, many studies were done to try to “hit the ground running” when a decision is made. “We used up several thousand ‘number two’ pencils with studies up to now, trying to figure out what might be done with the hardware that does remain in the factory,” noted Whipps. “At this point, we just need to wait to see which of those is the chosen directions and if so, we’ll be able to get a running start on those based on the [studies] we’ve done up until now. While ET-94 is a fully-assembled tank, some manufactured parts for additional tanks (beyond the point the production line was ended) remain at MAF, and Whipps said that the option to use those is also part of the discussions about how to proceed. “There’s a trade space that makes one or the other preferable,” he explained. “Depending on the decision [of] which potential engines to look at – whether you try to use the Shuttle main engine or some other type of liquid engine – you may decide that it’s a better, faster way to get to testing to use ET-94. “However, there is a case to be made that using parts for might be ET-139 (of which there are some piece parts in the factory) may be a better case, but that would require starting up more of the factory. Instead of just the TPS (Thermal Protection System) mechanics and sprayers and what not, now you’ve got to go back and start up the weld machines and do a significant factory turn-on to do an ET-139. A clear future direction will allow MAF to at least begin to assign studies into using ET-94 for a HLV role, given parallel studies into keeping ET-94 as a potential Shuttle asset – as ‘preserved’ in the Senate bill – would lead to a bottleneck, as Whipps noted both options can’t be preserved all the way through the refurbishment work.